do not let these pictures deceive you, 'little olive' at only 10 weeks old is already in training for christmas, when she hopes to put her huge ears to good use by being 'the other reindeer' for santa. oh boy, olive is so sweet! 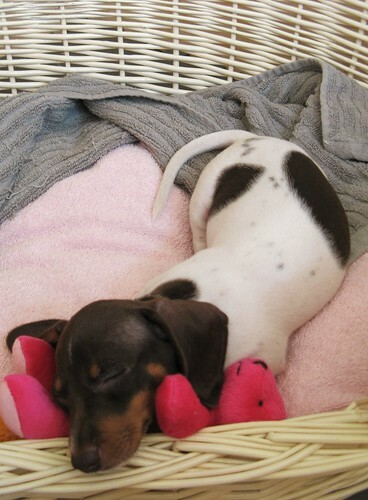 Cuteness overload...a sleeping adorable puppy..it can´t get better! She is the cutest little pup! Tell her - she will grow into her ears :D She is very cute. oh she is VERY cute! Hope you and your family enjoy the gorgeous puppiness. ...OH~me...Oh~my..she's the CUTEST pup...and photo #4 takes the prize...those sweet, baby wrinkles on her mini leg...OH~me...Oh~my!!! 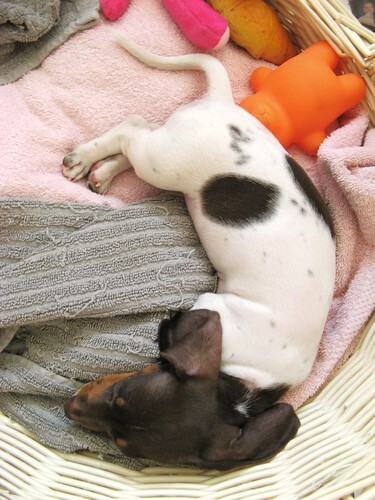 what a sweet, sweet little pup. the images are absolutely adorable!! Congratulations on your new addition! I was going to ask if she was Olive the Other Reindeer but you answered that question for me! Too cute and I can 't wait to see her with the antlers! What a sweet dog! 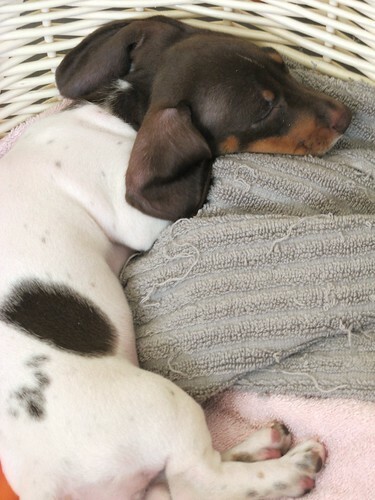 Our little dog is name Olive, too. We thought she looked too much like the dog in the book to name her anything else. possibly the MOST darling dog, ever. 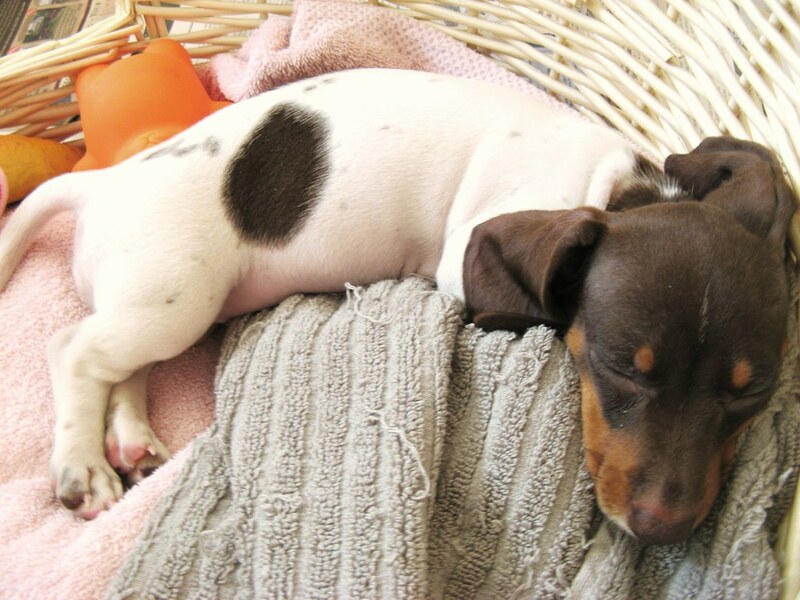 I don’t wish to cast aspersions upon Olive’s parentage but I’m guessing dachshund/terrier? those cute little 'olive' shaped patches had me from week one. just as well 'cause she's a bundle of trouble and isn't afraid to make herself heard!! we had to log on just to 'meet' olive and we're all in love. what a sweetie. hope used dog is coping ok with the new arrival. omg she is totally and utterly adorable !!! My friend, Julie told me about you....so here I am. 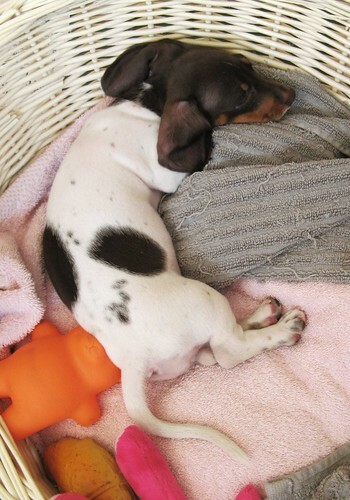 I love your site....and even more..I LOVE you "Little Olive". 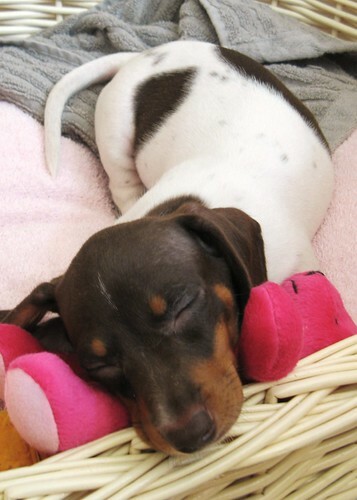 What a doll..she is adorable....What a lucky dog. I just love seeing a dog get a good home. I have my blind 14 year old (have had him since he was 8 weeks old) red toy poodle, Butterscocth. He is laying on my lap right now. My baby ! My life! Have a great first weekend of August. I want to name my first daughter Olive, my mom wants to kill me! Oooh! She is so cute and I love her name! Best of luck with all the puppy stuff. Sending lots of thoughts for lots of patience! ;) She's so darn cute. 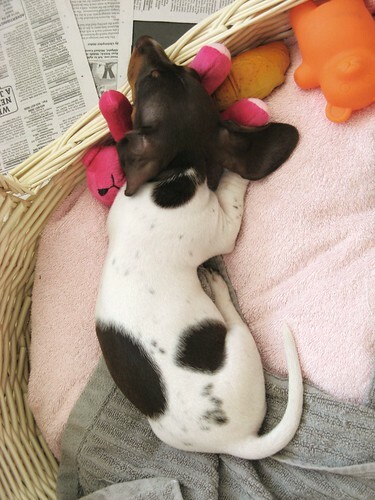 I love dachshunds. I've never seen one with this coloring! Last year, I was eyeing up the miniature ones (teacup) but I'm not sure if I'm ready for a house dog yet (with all this construction still going on)! I came by way of Soule Mama. Are you in the Seattle area. I've been living here for 3 years and I have yet to find a truly great art store and fabric store. 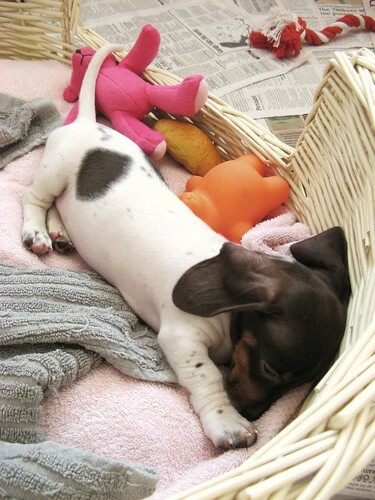 No, no...it's TOO much puppy CUTENESS! oh miss tif! ...she is just so perfect and cute and adorable and sweet and perfect and i imagine a whole lot of fun! btw, did you see the wee blog feature sfgirlbybay did about our 'all colours in...' flickr group!? ...i wondered where the flurry of activity was coming from! What a cute little baby. 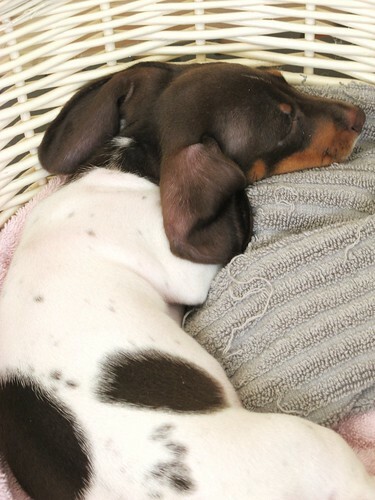 Puppies are so cute when they sleep.